In the past while doing my produce shopping, I sometimes felt that I opted for the same vegetables all the time—spinach, carrots, kale and broccoli. So the urge would strike to try something new that was not part of my normal repertoire. Such inspiration occurred a few years ago after returning from Italy and sampling cuisine that incorporated fennel. Fennel was definitely not a vegetable that my mother used, and I had no idea what to do with it. Out came the cookbooks. Research revealed that I was missing out. Hopefully with this article you will introduce fennel into your diet. Besides its unique flavor, it provides a wealth of overall health benefits! Fennel is native to the Mediterranean region, especially Italy and France. The emperor, Charlemagne, declared “fennel was essential in every garden because it had healing properties.” The fennel plant is divided into three parts: the bulb, the stalk and the leaves. All parts are edible. Once the plant goes to seed, the seeds are collected and then used as flavoring agents. In addition to being a food product, fennel is used in mouth fresheners, toothpastes and antacids. Vitamin C—Fennel is an excellent source of vitamin C. One cup provides roughly 17.5% of the RDA. It is best to obtain vitamin C from raw foods, as heating will destroy vitamin C. Vitamin C is one of the body’s primary antioxidants. Antioxidants neutralize free radicals, which are believed to be the causative agents in many diseases. Dietary Fiber—Fennel is a very good way to increase your fiber intake. Ensuring fiber in the diet will aid in proper digestion. For additional info on the benefits of fiber, see my article on greens at http://www.bettereatingcoach.com/121112-its-good-to-be-green.html. Potassium—Fennel is a very good source of potassium. The mineral potassium is important in aiding to lower high blood pressure (a risk factor for stroke and heart attacks). Potassium also plays a key role in muscle contraction and digestion. Folate—Fennel ranks as very well in this B vitamin in that it is important in fetal development as well as in cardiovascular health. Other vitamins and minerals—Fennel also is a good source of calcium, magnesium, molybdenum, phosphorus, iron, copper and B3. Phytonutrients—Fennel is comprised of a unique combination that offers antioxidants that may keep us healthier. One phytonutrient called “anethole” has been shown in animal studies to reduce inflammation and may help prevent the occurrence of cancer. So how does this translate into our everyday lives? 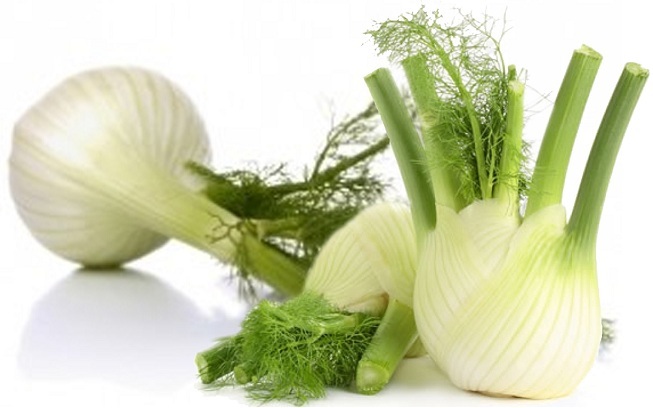 Fennel’s actions can help improve our health in a number of ways. As we are in the throes of flu and cold season, fennel may help alleviate some symptoms due to some of its components having expectorant properties. For those experiencing nasal congestion, try boiling 1 liter of water and add 4-5 fennel seeds into a bowl. Lean over bowl and inhale the water vapor by covering head with a towel. For sore throats, try gargling with fennel tea 2-3 times/day and before going to bed. If you are suffering from a cold or flu, make fennel tea by adding 1 tsp. of fennel seeds in a cup of boiling water. Allow to steep for about 5 minutes. Fennel also may help those women experiencing menstrual issues or menopausal symptoms. The phytonutrients in fennel act as phytoestrogens that may help to regulate the female hormones. The anti-inflammatory properties may soothe uterine muscles lessening menstrual cramping. The estrogen properties may help balance the hormones resulting in fewer hot flashes and other menopausal symptoms. In addition to eating fennel, imbibe fennel tea as described above. For menopausal symptoms, have fennel tea 2x/day. If experiencing menstrual cramps, drink fennel tea three days before symptoms appear and until they usually pass. Fennel can be prepared in many ways—raw, braised or roasted. It can be in salads, soups and stews. The leaves can be used as an herb seasoning. For an easy and delicious salad using fennel, see my recipe http://www.bettereatingcoach.com/recipe-winter-2013.html. Fennel spoils and loses flavor quickly so refrigerate and use within 4-5 days. Even better, if you have your own garden, try growing fennel yourself—it’s quite easy!